In stock 156 items in stock. 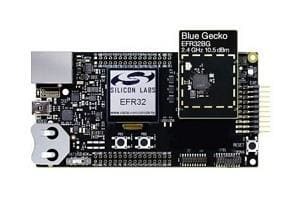 This is a Wireless Starter Kit with the BRD4104A Radio Board that makes an excellent starting point to get familiar with the EFR32™ Blue Gecko Wireless System-on-Chip (SoC). It also provides all necessary tools for developing a Silicon Labs wireless application. The BRD4104A is a plug-in board for the Wireless Starter Kit Mainboard. It is a complete reference design for the EFR32BG13 Wireless SoC, with matching network and a PCB antenna for 10 dBm output power in the 2.4 GHz band. The Wireless Starter Kit Mainboard contains an on-board J-Link debugger with a Packet Trace Interface and a Virtual COM port, enabling application development and debugging of the attached radio board as well as external hardware. The mainboard also contains sensors and peripherals for easy demonstration of some of the EFR32's many capabilities. EFR32BG13 Blue Gecko Wireless SoC with 512 kB Flash and 64 kB RAM (EFR32BG13P632F512GM48). 8 Mbit low-power serial flash for over-the-air upgrades.